OWS: rising to discursive hegemony! Yeah, it’s funny. Caricatured elites protesting to defend privilege. But Occupying Wall Street is setting the agenda. Bourgeois organs have to respond, if only ironically. Bush’s speechwriter Matthew Dowd used to say that if you oppose us while still using our language, we’re winning. Looks like someone different is winning, at least for now. This cover exemplifies why I cancelled my New Yorker subscription early in the Obama administration. Like the New York Times, they’re part of the “let’s keep the status quo” problem and won’t say bad things about Dems,. The New Yorker is certainly establishment, albeit mostly Democratic Party. But I do wonder if maybe you missed the irony of the cover illustration. Had the illustration portrayed the actual OWS demonstrators w/ exaggerated counter-cultural clothing, smoking weed, dancing, and holding signs with truly trivial messages, …well, then, *that* would have been a clear statement from the right, from the establishment, and it would have been a clear attempt to devalue the OWS protests, protesters, and their (our) message. But this illustration does not devalue the protests or the protesters, or their (our) message. 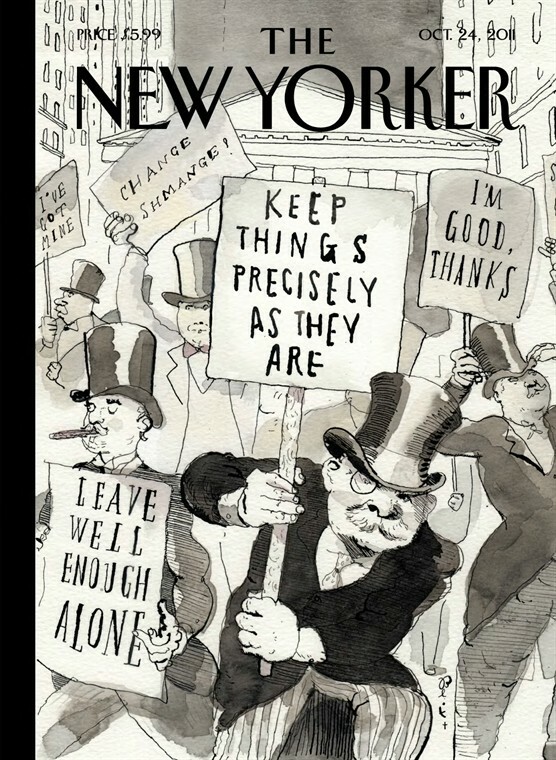 Indeed, it reinforces the message of the OWS protests, by portraying that top “1%” (the very rich) in a caricatured form, and by showing that the very rich are benefiting from the status quo. Moreover, the illustration ONLY shows the very rich defending the status quo, and thus, the illustration implies the status quo ONLY benefits the very rich. Finally, one would be foolish to dismiss the New Yorker as a whole for simply being some establishment publication without value for the radical left. In fact, the investigative reporting by Jane Mayer and Seymour Hersh, among others, has proven to be invaluable. If activists on the radical left in America only confine themselves to Democracy Now, and the occasional article or lecture by Noam Chomsky, or any other single source on the left (including Henwood), then we’ll be in deep trouble. Oh, yeah, we are in deep trouble! Seriously, American leftists ought not make the same mistake as so many on the American right do — which is to demonize & ignore the entire “mainstream media” while simultaneously accepting, without critical analysis, everything that comes from a small number of politically-correct sources.